Second Innings for Dr Tharoor - Another Chance for Trivandrum! With the latest reshuffle of the Union Cabinet, Trivandrum's MP is back at the most important table in the land. 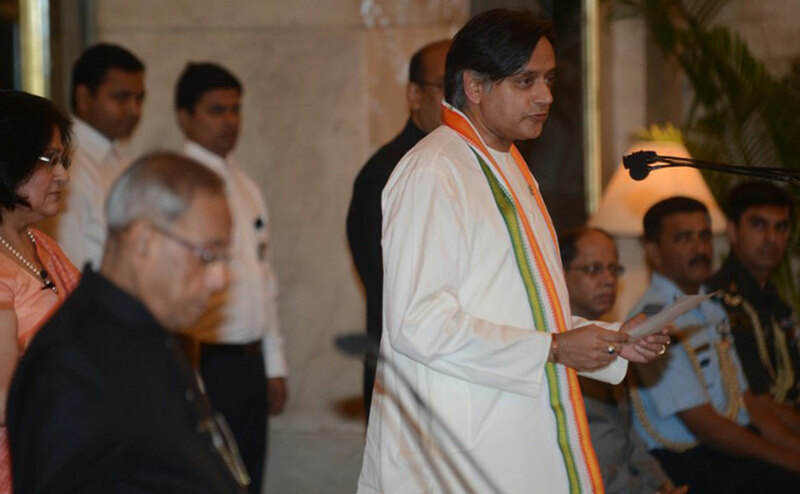 There can be few better choices for the Ministry of Human Resources than an erudite scholar and internationally acknowledged author, although it seems that Dr Tharoor requested the particular portfolio instead of a stint back at his forte, External Affairs, in order to focus more on his home constituency. That would be a very rare occurrence in a day and age where most politicians would first look at the personal benefit from a portfolio before even bothering with such optional niceties as working for their constituents. Many of us would immediately hope that his ascension would lead to a quick solution to all the issues that Trivandrum faces. Let's be practical, no one has solved such a plethora of problems in a single day since that hallowed carpenter of lore from Nazareth. That said, we can expect that Dr Tharoor's new role will help him get better access to the workings within the North and South Blocks, the apex of power of the country and help facilitate key initiatives within his portfolio and beyond. A few of the key agenda items have been enumerated in this article. Do let us know what you think and whether there are more areas where you would like to see our MP focus on in the year or so left in the tenure of this Ministry. Please drop in a comment here or on the Thiruvananthapuram Updates blog. Thanks in advance. Once again, let's all join to congratulate Dr Tharoor on his new role and to support him in his endeavors for our city. Over the last few months, the saga of Kerala's flagship infrastructure project - the Vizhinjam deep water port and container transshipment terminal - has wound a new stretch in its long running and tortuous route - losing its lone bidder for the what would seem to be the coveted position of port operator and then getting met by a propaganda offensive by a vested interest lobby consisting of a few small resorts in the project area who are hiding behind environmental and social concerns to ensure that the nests are not disturbed even if it means sabotaging a multi-Billion dollar project that would benefit the entire nation. The current Government's performance on what should be their top priority in terms of developing world-class infrastructure has been lackadaisical at best, with nearly a year elapsing between the receipt of two financial bids and the opening of the same, more months dragging along as the Government vacillated about accepting or rejecting Welspun's bid that demanded it be paid to operate the bid and for its limp response to the audacious assault by the resorts, one of which apparently has not-too-subtle links to the powers-that-be. Today, there is profound confusion as to how to proceed, with the crucial element of the project operator still very much amiss. Add to that the fact that the market study and project options report prepared by the UK consultant Drewery and the project's principal consultant, the International Financial Corporation (IFC) were gross under-estimations, at best, of Vizhinjam's potential and, at worst, near criminal manipulation of reality. In short, it looked like the bases were heavily loaded against this dream project. On this, a lot of people were in agreement. On what, if anything could be done about it, there were a lot of differing opinions, I am sure, most tending towards a shrug of the shoulders and resigning ourselves to the tender mercies of foreign port operators and not-so-foreign envious powers. On the other hand, we can pause before shrugging things off our shoulders and put up our hands to provide inputs to improve the project's current dismal lot. Of course, there are two key elements to create an effective intervention in a project of this magnitude. First, bring together people who have relevant knowledge and experience, and equally importantly, a passion to contribute. Secondly, and just as critical, is to have a way to cut together the usual frustratingly opaque and impervious bureaucracy that controls public projects and to get attention at the highest levels. In the case of Vizhinjam, the first part started to come together when a friend of mine and fellow CET alumnus, Deepak Benny, who has now specialized in port design since his CET days, contacted me with a number of suggestions that he had about improving Vizhinjam's design. Soon we combined forces with a long-time friend and co-conspirator of mine (again of the ol' Kulathoor tribe, a'la Royal Mexx circa 1993) - Hari Gopinathan, a well-known gent at the HQ of tech giant Oracle Corporation. Despite having only a third of the combined neurons qualified to talk about marine structures with any confidence, we put our heads together to come up with a focused set of improvements on key aspects of the project - the master plan, the business concept and the way ahead. Crowd-sourcing is much more commonly used to crunch numerically intensive problems and R&D challenges but this was as worthy an application as any. The second component, the delivery/intervention mechanism is equally, if not more, important to the success of the initiative. In this case, the answer was obvious, reach out to the one Director of VISL who could and would assimilate our suggestions and put them into action. No prizes for guessing that I am referring to Dr Shashi Tharoor. Having collaborated with Dr Tharoor on many an initiative to benefit Trivandrum, including facilitating the arrival of Oracle into Kerala's capital city (that's a whole other story, which will await a detailed account at another time), we resolved to pitch our suggestions to him. Reviewing the nearly 800 pages of bid-related documents from Drewery, IFC and Royal Haskoning uploaded by VISL, and the initial master plan put out by them based on the rather conservative recommendations given by the trio of consultants, we identified three key areas where a quick intervention was needed to ensure that not only was the project's potential was maximized but that a capable operator could be attracted sooner rather than later. First, it was essential to take a fresh view on the potential of the project. Drewery's predictions were rather meek, to put it mildly. They essentially predict that Vizhinjam will jostle with the crowd of existing Indian ports rather than take the fight to regional hubs such as Colombo, Dubai, Salalah and Singapore despite having superior draft, strategic positioning on the main shipping lanes and direct access to the rapidly growing Indian market. Drewery would have us believe that even after offering massive discounts to the tariffs at Colombo, Vizhinjam would capture but just a fraction of its business. Moreover, it blithely ignored the fact that shippers seek the most efficient and cost-effective supply chain, so if Vizhinjam offers a faster, better and cheaper way to reach Asian, European and American markets by attracting mainline ships, cargo currently using other South Indian ports could easily shift to Trivandrum. Finally, Drewery had completely played down the potential for other types of cargo such as energy import (Vizhinjam is ideally located with respect to the most important sources of coal and natural gas in the region - Australia, Indonesia and South/East Africa), cruise traffic and the potential for a deep water shipyard (citing a rather dubious need to make the port "green and clean"!) Our approach was to be bold, to try and maximize the potential of the port and to identify the ways and means to achieve that. While our rudimentary approach is admittedly far from what a Drewery could do, it was based on simple concepts of logistics and market economics. More on this later. Second, we looked at the master plan released by VISL in early July 2012. Taking direct input from the recommendations of the project consultants, whose focus seemed to be cut corners at the expense of giving the project the tools it needs to compete with regional hubs like Colombo and Dubai - deep draft, adequate berth length and basin size/turning circle radius (all necessary to accomodate the biggest container ships around, like the current Maersk E-class or the upcoming Triple-E class). By shrinking the port's basin and positioning the breakwater close to shore, the plan virtually eliminated the possibility to have a second line of berths located on the other side of the basin along the breakwater. Since the project has limited quay length along the coast (due to populated areas North and South of the site), the only way to expand it would be to build berths along the breakwater. Locating the cruise terminal at the end of the Phase I container terminal would hinder further expansion of the container facility. Third, it was evident that the Government needed to change the game-plan for the project if it was to get off the drawing board. Rather than focus just on the port itself and expect the best of the best among port operators to form a line round the block to run it, the Government needs to expands its horizons and look at the enabling infrastructure and policies, as well as to build more demand drivers for the port through the establishment of logistics zones and a port-based power plant, for example. After many a deliberation, over the phone and, more often, over email, even more hours spent researching unfamiliar subjects ranging from marine engineering to gas turbines, and even, even, more cups of coffee, a coherent vision document emerged which sought not only to correct some of the issues that we perceived with the port's concept and design but also to provide what we hoped were innovative and game-changing solutions to make it a premier, world-class facility set up to succeed. The easiest way to get the message across was deemed to be that trustworthy tool of the ilk of Mitt Romney (ahem....management consultants and PE bandits, that means you!) - the Power Point presentation. And here it is, for your purview and critique, ladies and gentlemen. I do hope that all of you will take the ten minutes needed to run through it with the level of detail that will enable you to appreciate how complex this project is and how rewarding it can become. The slides are pretty self-explanatory and I will pretend that we understand all of it any better than you do. However, let me take the liberty of pointing out a few key ideas to exemplify the line of thinking that went into the document. Right at the beginning, on Slides 3 through 5, we have sought to demolish the rather under-assuming, almost apologetic at times, market assessment of Drewery and IFC, with a more bullish outlook based on the project's inherent and undeniable strengths. Next, on Slides 6 through 11, we identified four key pillars on which the project should be built - its Strategic Location, its Global Scale, Globally Competitive Operating Costs and the potential to be a Gateway Port to the whole of South India (as opposed to just a narrow strip between Tuticorin and Ernakulam, as Drewery espouses!). Slides 12 through 15 discuss non-container uses at the port, namely LNG import, cruise traffic and a deep water shipyard, which found scant mention in the original market report. Next we get to the section that discusses improving the master plan, explained in some detail in Slides 16 through 19, focusing on what we call, in typical Vegas fashion, an "All-In" strategy that seeks to swap the cut-corners, minimalist design out with one that provides the facilities that can maximize the potential of the project and position it as a unique facility that can accommodate bigger, (and consequently) more efficient ships than any other Indian port at a similar distance from the shipping lanes. This includes expanding the terminal's capacity right from Phase I, moving the cruise terminal to the breakwater and expanding and deepening the port basin. The next couple of slides are devoted to suggesting simple modifications to the Landlord Model of port development, that seek to simplify the picture for a private operator while improving the State's payback from the project for the $700 Million that it will invest in Phase I's marine and landside infrastructure. Slides 22 through 28 focus on the infrastructural and policy support that the State and National Governments have to provide in order to ensure that this project vital to the national interest, succeeds. These include creating adequate road and rain connectivity to ensure that cargo unloaded at Vizhinjam can reach as far as Hyderabad in 36 hours or less, which calls for an average travel velocity of just about 40 Km/Hr (not a tall order if you have relatively congestion-free rail lines or a 4 lane highway all the way, which as we know, is definitely not the case at present, at least till we hit Kerala's borders!) There's a lot that New Delhi can do, such as funding the road and rail improvements and ensuring that the much deeper and better located Vizhinjam gets the same policy support, such as Cabotage exemption, as the container terminal at the port in Ernakulam recently did. Being a State-project and structured in a way such that the Viability Gap Funding option is unlikely, Vizhinjam will most benefit through direct support from the Center, as described above, as soon as the Center figures out that rather than pour money into its "Major" ports, most of which are now becoming uncompetitive, it should focus on strategically important ports like Vizhinjam that can actually further our nation's interest by weaning Indian cargo away from foreign ports like Colombo and Dubai. For example, the port at Ernakulam needs hundreds of Crores of dredging each year to achieve and maintain a draft of 14 m (which it has failed to achieve even after three years of dredging), whereas Vizhinjam has a natural draft of 18 m from day one! The same advantage is held by other new ports such as Mundra, Pipavav and Gangavaram. We conclude with a brief suggestion on the immediate way forward that VISL and the State Government need to pursue - essentially to complete the master planning process, the Environmental Clearance process and simultaneously try to identify and engage a world-class port operator, even as the tender process for the massive construction contract also moves forward. After a couple of discussions with folks in the Indian ports business (working with two of the biggest port developer-operators in the country), it's pretty evident that the best choice for operator would be one of the leading global players, ideally one with a tie-up with a major container line. Of course, the option # 1 is AP Moller Terminals, the terminal operating arm of the APM Maersk group that also operates the world's largest container ship fleet, that includes the biggest class of ships in the world. APMT already operates a terminal at Pipavav and another in Colombo, but may be looking for a deep water port in South India close to the main shipping channel. Vizhinjam fits the bill perfectly. Prior to all the detailed deliberations and to preparing this slide deck, we had raised the alarm with Dr Tharoor, as soon as the first VISL master plan became public. It was a natural choice to reach out to him, not just because of his ex officio roles as the MP and a Director of VISL, but because these complicated issues needed someone with global exposure and strong intellectual ability to understand. We were trying to improve on the work of some of the world's most famous and highly-paid consultants, after all, so things would get a bit complex! Having worked with Dr Tharoor on many occasions, there was not an iota of doubt that he was the ideal, I'd even say the only, person to reach out to and to explain all our concerns and suggestions to. In the midst of a busy travel schedule, one would have expected him to take a few days to act up on our red flag but we were about to be pleasantly surprised! On the same day, he called a meeting with the senior management at VISL and impressed the need to make changes on them. To their extreme credit, both VISL and AECOM were very receptive to Dr Tharoor's inputs and their request for detailed inputs led to the slide deck above. Eventually these led to a re-worked master plan and a detailed discussion with VISL and AECOM on the side-lines of Emerging Kerala, chaired by Dr Tharoor. More on the outcome later, stay tuned! Hopefully, this initiative will have made at least a small but tangible change in the course of this behemoth of a project, and a positive change at that. Because both the risk and the opportunity in a project of this type lies primarily in its concept and development strategy as opposed to its actual construction, we believe that an intervention of this nature will be able to steer the project in a more successful direction, where it banks on its inherent strengths to boldly go where no Indian port has been able to go before and take the fight directly to the regional hubs and prove that Indian logistics will not always be the inefficient mess that it's been till now. If this little venture plays a part in that, it'll also vindicate a new application of crowd-sourcing, one which is catalyzed by the right kind of elected representative.